Instead of a rigid, taut surface, Angela de la Cruz’s canvases buckle and overlap as if the stretcher had been snapped in two over the knee. One of this year’s Turner Prize nominees, this Spanish artist based for the past twenty years in London subverts the notion of illusion built up in paint that constitutes the western tradition since the Renaissance. True, other artists since the second world war like Fontana have deliberately punctured the trompe l’oeil fantasy of painting while some artists, most notably Jackson Pollack, have emphatically asserted the material factness of paint applied to a supporting (canvas) surface. But De La Cruz radically deconstructs paintings to suggest their inherently premeditated nature. ‘Ashamed’ sits astride a corner of the gallery wall but is doubled up upon itself as one half partially covers a lower panel that together had formed one flat panel. This doubling effect through forceful manipulation of stretcher and canvas begins to form a crack or bodily cleavage as the light casts a shadow over the point where the two panels meet. An unnerving creamy crust is formed out of the painted surface. This small painting sitting unobtrusively in a far corner introduces ideas of rupture and collapse and which characterises several canvases that produce a sculptural rather than painterly presence in the gallery. On a larger scale, a work titled ‘Homeless’, resembles a life size canopy that might function as a shelter on the street. 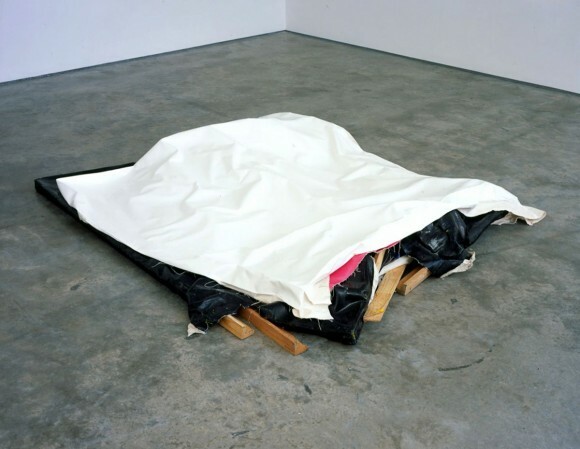 Here the loose canvas is freed from tension and hangs limply from the stretcher uncannily resembling malnourished folds of skin that hang from a broken body. This conceit of the painting as corporeal proxy is employed again in ‘Deflated IV’ where the remaining horizontal arms of the stretcher slope downwards in a poise reminiscent of a crucifixion. As if to hit the point home, the red canvas folds released from their frame hang like a flayed body against the bleached gallery wall. In the centre of the room, the legs of a collapsed chair splay outwards horizontally on the floor pulling the seat firmly to earth with a bump. Perhaps this structural surrender refers to the artist’s recent illness, which has confined her to a wheelchair. Material certainty is consistently questioned in these pieces and this essential fragility produces inevitable bathos. The expectation of a painting functioning as a servant to artistic intention is subsumed by a physical autonomy that speaks of both exhaustion and defiance. What we encounter is a teasing exploration of painting’s symbolism and its intrinsically constructed nature. 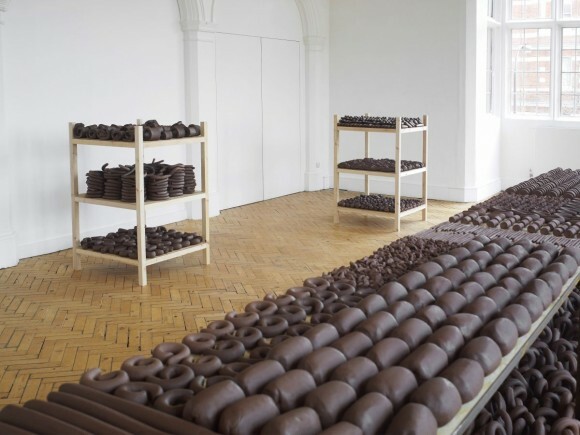 Concurrently, Camden Arts Centre hosts a site-specific work, Continous, by the Brazilian artist Anna Maria Maiolino which demonstrates a dedication to the handmade and to group participation. Her work originates in the urgent struggle against military dicatorship and the call by Helio Oiticica and Lygia Clark amongst others for a democratic art employing sensual engagement and for a sense of wonder in work made from humble materials. Here Maiolino has built an entire environment of repeating clay forms that she has rolled and shaped by hand. Long coils rise, fall and turn like tangled piles of elongated sausages. Pieces resembling sliced swiss rolls or doughy buns are laid out on a long table as if they were merchandise in a bakery. Other more elemental processes are deliberately invoked and are reminiscent of ingestion and expulsion. This scatological allusion is subtle but unavoidable. Maiolino has reduced the making of art to its bare bones ­– kneading, rolling, coiling and cutting – she suggests the myriad ways hands construct and express basic forms. Assembled together these odd, but repeating shapes made of earth without decoration connect us to the arc of a material journey. But unlike de la Cruz’s hybrid painting/sculptures, Maiolino’s installation of precise but simple shapes articulate the human impulse to craft work out of formless, organic material and returns us to primal urges in prehistory and childhood.. If there’s any doubt about the piece, it lies in its incompletion, as if these blobs of shaped earth require some kind of resolution. Laid out en masse they impress with symbolic possibility but the project is rather anti-climactic, echoed by the wire mesh that runs along the wall into which some plugs of clay have been randomly inserted. Large areas of fence remain unfilled – did the artist run out of time or is this a deliberate nod to every artist’s unceasing quest?